After a highly anticipated arrival, Kitchener-Waterloo’s new ION Light Rail Transit System has been again delayed until the spring of 2019. This 19-kilometre transit route, consisting of 19 stations between Conestoga Mall and Fairway Station, has been a project in the works since 2012. In 2013, Waterloo region entered into a contract with Metrolinx and Bombardier that outlined the purchase of 14 LRT vehicles with the prospect of purchasing up to 14 more in the future. This contract also stated that all vehicles were to be issued with a “final acceptance certificate” as on January 2017, making them fit for service. As well, the fourteenth transit vehicle was expected for delivery by the end of December 2016. It is clear that the expectations of this contract have not been met and disappointment is prevalent throughout the region by both members of the municipal council and the community. As a result of these past delays, the region announced in the spring of 2018 that the start of service for the LRT would be postponed to this December. However, the region and its partners in the project have concluded that they need more time. “We’re going to have to take some more time to get the vehicles ready, get them tested and get them certified,” said Tom Galloway, chair of Waterloo Region’s Planning and Works Committee. The most recent start-of-service schedule indicated in September that the LRT would be ready for commuter use by the end of December 2018. This manifests that the delay was generally unanticipated by the region and it’s Planning and Works Committee. “[Regional] staff really only came to know sometime quite recently that Bombardier was not going to make this date,” said Galloway. An ION vehicle and testing update was released by the Waterloo municipality on Nov. 6, indicating the project’s progress. This report stated that, in summary, 11 LRT vehicles have been delivered to Waterloo, four of which have specialized on-board equipment installed. The other three vehicles are in Kingston awaiting delivery and specialized on-board equipment has been installed on one. To achieve such certification, the vehicles must be fully assembled, continual modifications to the vehicles are completed and each vehicle passes routine inspections. “It has to do with safety for sure … but the certification also signals payment for the vehicle. We’ve not yet paid for any of the vehicles,” said Galloway. Both Bombardier and GrandLinq have a significant amount of testing ahead of them for the 14 LRT vehicles headed for Kitchener-Waterloo’s streets. Bombardier is in the process of qualification testing on pilot vehicles in Kingston, and GrandLinq is completing system integration testing for the vehicles currently in Waterloo. 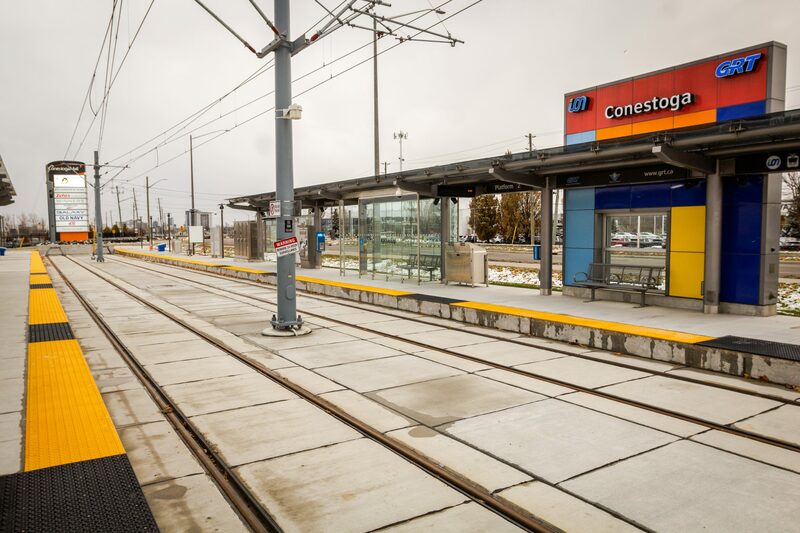 This recent report concludes that based on several safety and testing variables, it is generally difficult to predict the start of service for the ION LRT, however, the region is aiming for sometime in the spring. “Regional staff will continue to closely monitor Bombardier’s and GrandLinq’s progress and schedule will work diligently with them to get the system into service as soon as it is feasible and safe to do so,” reads the region’s statement. As of now, the start of service for the ION has not been given a date due to a level of uncertainty at this point in time. “We want to wait until we have a good number of vehicles certified and have a high level of confidence,” said Galloway. Weather conditions for the start of service in the winter have also posed some concerns among the regional council. “We may have been able to start in February or March, but we made the decision that we would rather start in the spring as opposed to the middle of winter,” added Galloway. While commuters wait for the LRT’s start of service in Waterloo region, there have been initiatives to keep the public informed of its progress and make sure that riders will be prepared for its usage. As a part of the region’s public outreach program, ION vehicles will be available for public observation on several occasion. At the upcoming Christkind Market on Dec. 7 at Kitchener City Hall, an ION vehicle will be parked at the designated station to provide the region’s residents with the opportunity to view, board and discuss. This will promote the community’s inquiry on service and safety features for the LRT and the region hopes to provide residents with this valuable information.